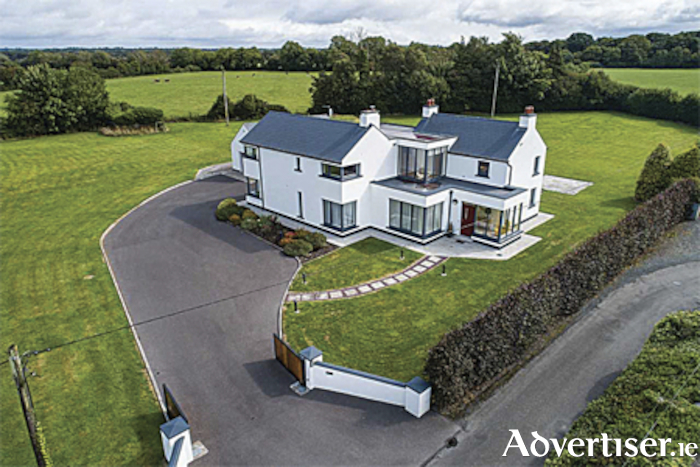 Description: A unique opportunity exists to own this exquisite residence nestled on the outskirts of the riverside town of Banagher and enjoying impressive living spaces (in excess of 3000 sq.ft ), a detached office and garage and its own large private site measuring c.1.6 acres. Nearby Banagher town and all its amenities, including primary and secondary schools and easy access to M6 motorway. Athlone and Tullamore are a short drive away. Five Bedrooms, three reception rooms, four bathrooms, house, detached, garden, land/paddock, patio, private parking, garage, rural, central heating, very good decoration, 290.0 approx. sq. metres, land area 1.64 acres, BER B2. Tranquil location in a pleasant countryside setting. Constructed in 2011 under the reputable Hoctor Smyth Architectural /Engineering Secure and fully automatic entrance gates and exterior sensor lighting. Indian limestone patio, suitable for the Irish climate. Expansive lawn with mature shrubbery and an apple tree grove. Fabulous copper beech hedging along road frontage, offering privacy and beautiful seasonal colours. Mains water/group scheme. Septic tank. Asphalt driveway, offering high durability and ample parking spaces. Detached office to side of property, fully insulated and with Cat 5 network wiring. Presented to a very high standard throughout with open plan layout to kitchen/dining/living areas. Range style cooker in kitchen. Contemporary wood burning stoves in both living and sitting rooms. Recessed lighting throughout. Solid birch wood flooring. Porcelain tile flooring. Solid walnut Shaker style internal doors throughout. Underfloor heating on both ground and first floor level offering digital thermostatic heating controls in each room. Solid wood Custom built kitchen with walnut and cream mix. Quartz worktop and counter. Pressurized water system throughout the house. Highly efficient oil fired condenser boiler and insulated water cylinder located in garage using highly insulated pipes back to the house, offering zero heat loss. Highly insulated exterior walls (pumped ) floors and roof. DSL Broadband. Central TV and CAT 5 Hub managing network and TV access to all rooms. House alarmed. Finished garage with remote control doors and attic floored for extra storage. Minutes drive from the scenic, waterside town of Banagher and the village of Shannon Harbour. Easy access to the canal and its walking and cycle tracks. Agent for this Sherry Fitzgerald property is Helena Kenny 0868119190.